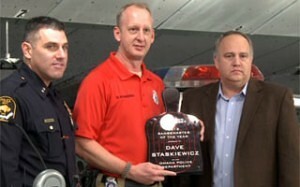 PROVO, Utah – Officer David Staskiewicz was recognized by Action Target as the 2012 Range Master of the Year for his continued excellence in law enforcement training. Action Target founder Addison Sovine presented Staskiewicz with the award at a ceremony held in his honor on December 13th. 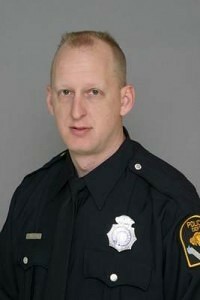 For the past ten years, Officer Staskiewicz has been the Omaha Police Department’s range master. 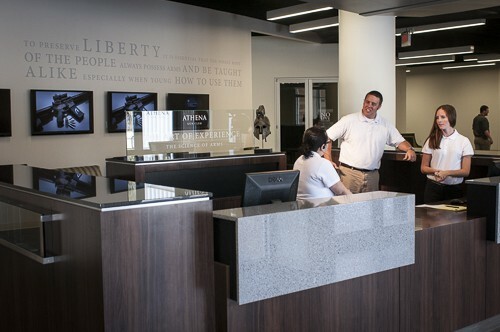 During that time, he has overseen the closing of the department’s 30-year-old indoor range and was instrumental in the opening of the new Public Safety Training Center ranges four years ago. 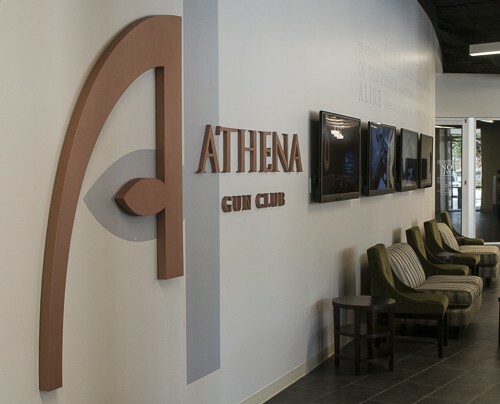 The new center includes a firearms simulator room, rooms for weapon, ammo and target storage, a room with 20 stations for weapon cleaning and two indoor shooting ranges equipped by Action Target with advanced tactical training technology. According to Staskiewicz, the last thing a police officer wants to do is discharge his or her firearm, but training for those occasions where force is necessary is extremely important. In addition to running his agencies three ranges, Staskiewicz oversees the firearms curriculum for his 800 officer department. 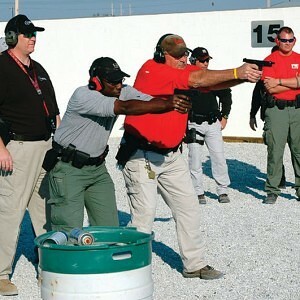 He has always been willing to share his lesson plans and training tips with other agencies and trainers over the years. 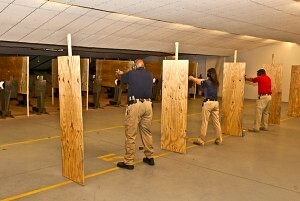 Some drills they conduct on the indoor tactical range include split-second threat identification, accuracy and speed training, as well as ambush drills in a patrol car with the windshield removed, drop targets and flashing lights to add to the stress. As we discussed in the first part of this article, rubber berms are a fantastic way to contain rounds on ranges that see limited use, but they aren’t perfect in every circumstance. Rubber berms have their limitations no matter what you may read. If you are considering installing a rubber berm on your indoor or outdoor range, make sure you have a clear understanding of the facts about what rubber berm are realistically capable of handling. Here are three more myths you may encounter in your research of rubber berm technology. CLAIM #4: Rubber berm traps are easy to clean. 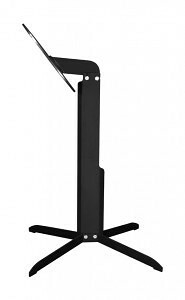 You can even do it yourself with a special vacuum or with doors on the back of the trap. When too many bullets are suspended in the trap for it to function safely, they should be mined from the rubber and disposed of properly. 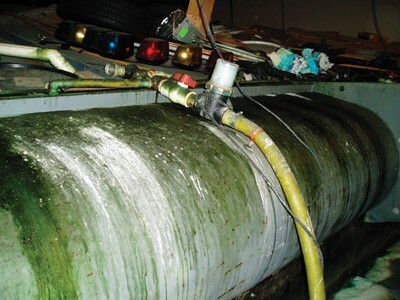 Some early claims stated that a million rounds per lane could be fired before cleaning was required, but our real-world experience and documented accounts reveal that a rubber berm trap should be cleaned after about 80,000 rounds per lane. 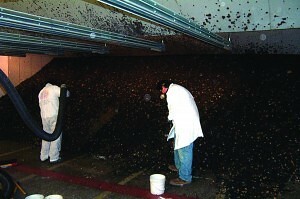 The process of separating the lead from the rubber can be a very specialized and time-consuming task. 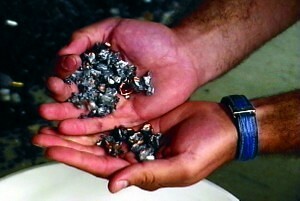 The top 8 to 12 inches of rubber are typically taken off the entire trap and then separated to remove the bullet fragments. The lead fragments can be classified as a recyclable material, but may require complicated permits to transport and dispose of legally. 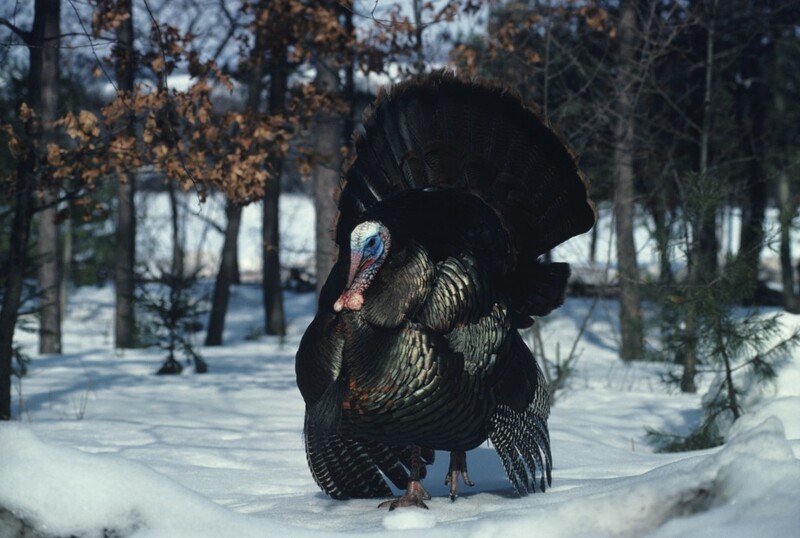 After the lead has been properly dealt with, the remaining rubber is placed back on the trap. 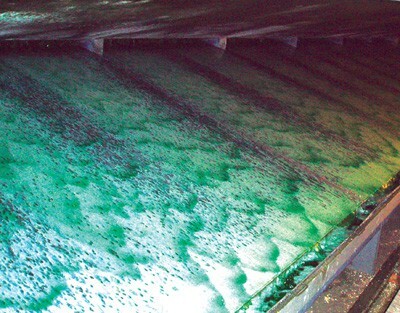 Even with the best industrial equipment, it can take an experienced crew nearly seven full days to clean a 20 lane trap. Because of the extensive lead exposure inherent in the process, everyone involved should be outfitted with the proper safety equipment including complete hazardous-material suits and certified respirators. Another claim states that bullets will travel all the way through the rubber to the rear of the trap where they can easily be removed through doors mounted in the back of the steel support structure. Our experience shows that handgun rounds typically penetrate only 6 to 10 inches into the usual 24 inches of rubber, and most rifle rounds only penetrate 12 to 16 inches. Even as newly fired bullets impact other bullets already in the rubber, we have not seen fragments even come close to the rear of the trap. 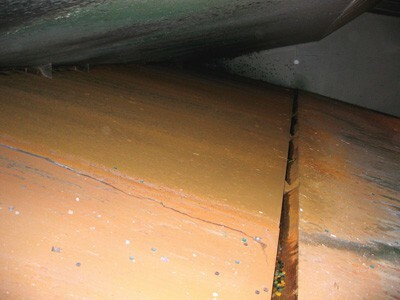 We have never found these “cleaning” doors to do anything more than add unnecessary expense and difficulty to the trap. 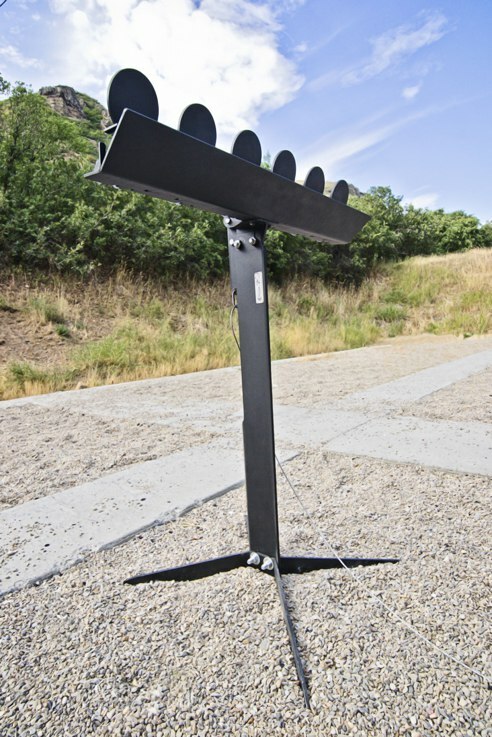 CLAIM #5: Rubber berm traps greatly reduce the noise levels on your range. 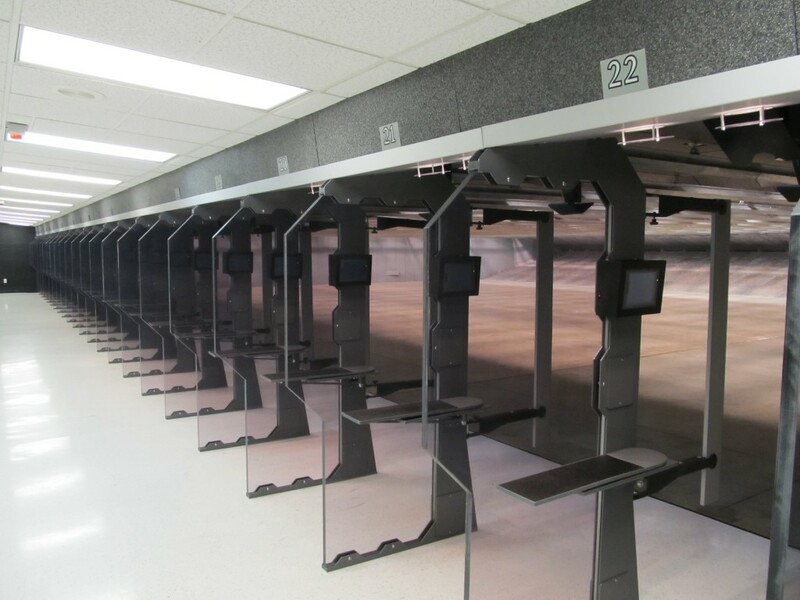 Sound problems on shooting ranges are caused by the noise generate when firing a gun and the interaction of that noise with the walls, floors, and other surfaces of your range. When you compare the surface area of a bullet trap with that of the floor, walls, and ceiling of a typical range, the trap typically makes up only about 5% of the total surface area. This small percentage combined with the fact that rubber is only a fair sound absorbing material means a rubber berm trap may have minimal impact on the sound levels on your range. 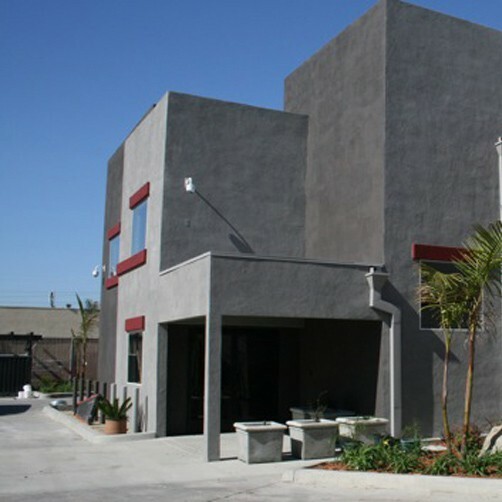 We have found that using proper sound absorbing materials and techniques on your walls and ceiling baffles can give far better results. CLAIM #6: Adding more technology and additional devices to your trap will improve its performance. There is only so much you can do to “technologically enhance” chopped rubber. That being said, let’s look at some of the most common add-ons to rubber berm traps. 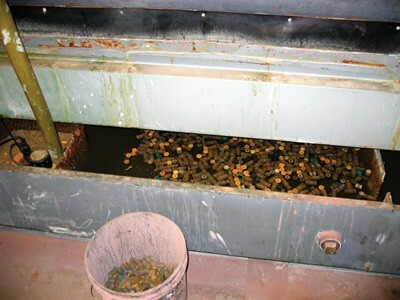 The first device is a large collection bin or “hopper” that spans the top of the trap. 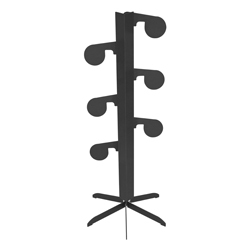 In certain cases, the chopped rubber has been found to migrate and flow toward the bottom of the trap leaving undesirably thin coverage near the top. When this happens, the extra rubber that accumulates at the bottom of the trap should be periodically collected and returned to the hopper. This process can be very labor intensive, and you should employ the same safety equipment and procedures used when cleaning the trap. 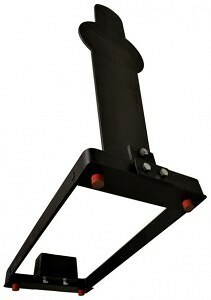 Another add-on uses large sheets of rubber that act as a skin over the entire surface of the trap. This cover is designed to help keep the small rubber granules in place and to keep small bullet fragments from escaping back toward the shooter. 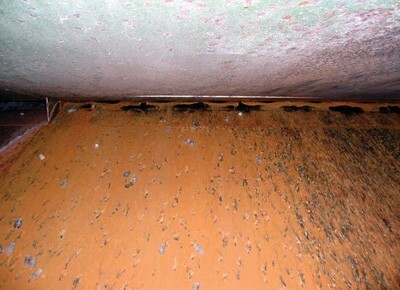 As shots are fired into concentrated areas, the cover can quickly develop larger and larger holes, requiring time and money to maintain. Another downside to a cover like this can be heat retention. 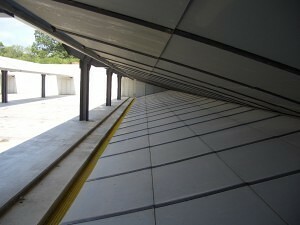 In hot conditions, the membrane may reduce the ability of the granules to “breathe” building up heat and increasing the chance of fire when other ignition events are present. 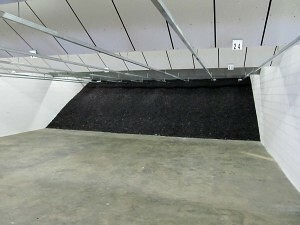 The equipment you install in your shooting range can have a significant effect on your range’s future success. Rubber berms work great on ranges that don’t see excessive everyday use, but if you start having more customers than you originally planned for, it quickly becomes a less than ideal solution. After evaluating the benefits and limitations of a berm trap design, you may conclude that this technology is the best overall choice for your needs. If not, know you have other options. 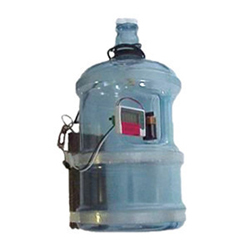 The Action Target Total Containment Trap (TCT) can be a great solution if you are going to run a lot of people through your range. With three different types of hands-free lead removal systems, the TCT allows for varying levels of use and greatly diminishes the time you have to spend maintaining your shooting range. If your range’s anticipated level of use is on the border of being too much for a rubber berm, plan on being successful and install a TCT. Don’t limit your long-term success based on short-term finances. 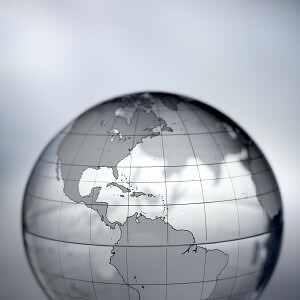 PROVO, Utah – The Steel Challenge Shooting Association recently named Action Target the official target of the 2012 Steel Challenge World Speed Shooting Championship. The championship, which is held in Frostproof, Fla., begins Nov. 1 and ends on Nov. 4. 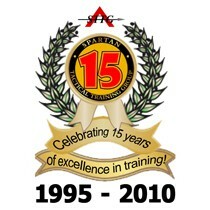 This year it will be held at the Universal Shooting Academy for the first time. 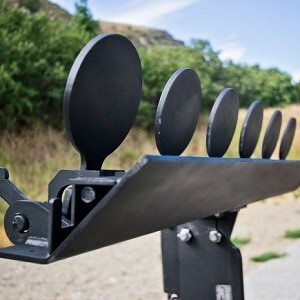 Championship competitors will face eight shooting stages with five steel targets placed at various distances on each one. 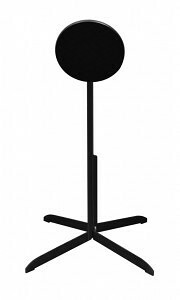 Action Target custom designed three targets for the competition featuring spring‐loaded armor steel head plates that provide extra bounce for immediate visual and audio feedback. Shooters from all over the world are expected to attend this year’s Steel Challenge world Speed Shooting Championship which is the culmination of the steel shooting season worldwide. 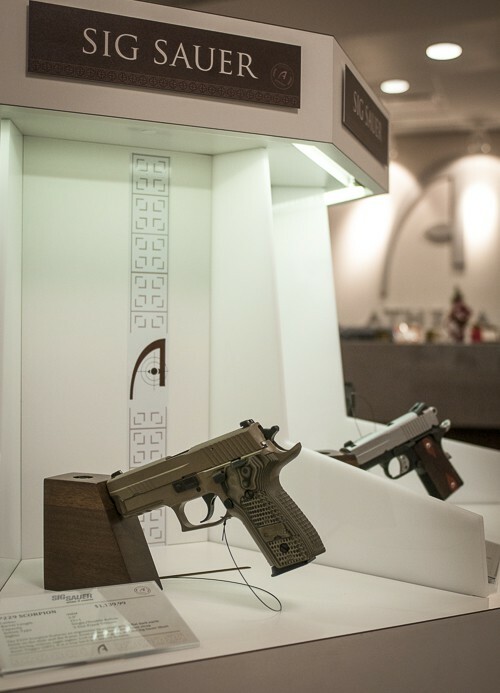 The match also features various walk‐up events where competitors and non‐competitors alike have the opportunity to shoot and win a variety of different guns. 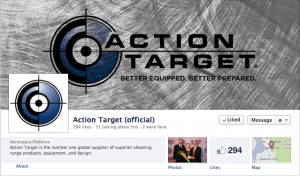 The custom targets designed for the competition by Action Target will be available for sale on its online store beginning January 2013. The Steel Challenge Shooting Association is a wholly owned subsidiary of the United States Practical Shooting Association (USPSA). 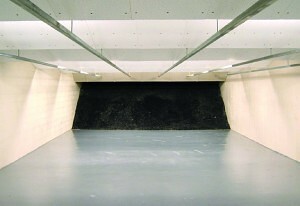 SCSA expands the shooting opportunities for its affiliated clubs and individual members. The United States Practical Shooting Association is a non‐profit membership association and the governing body for the sport of Practical Shooting in America. USPSA has over 22,000 members and nearly 400 affiliated clubs which host weekly matches throughout the country providing recreational shooters with the opportunity to test and refine their shooting skills in a safe, competitive environment. USPSA is also the US Region of the International Practical Shooting Confederation (IPSC), which is comprised of approximately 67 nations. 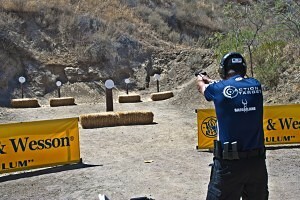 For more information, visit www.uspsa.org. 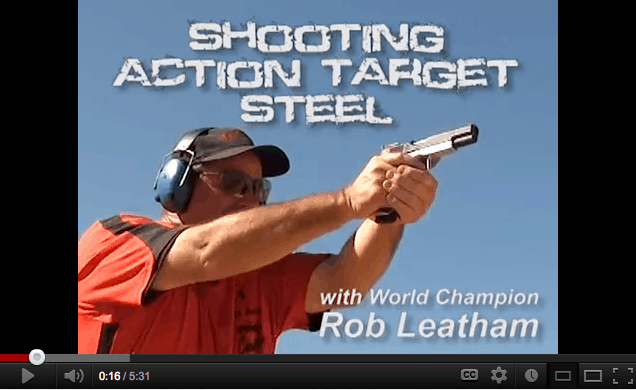 World champion shooter Rob Leatham knows that stress induced training is absolutely critical to competitive shooting as well as law enforcement. In an actual shooting situation, your heart is going to be pounding and your hand isn’t going to be steady. 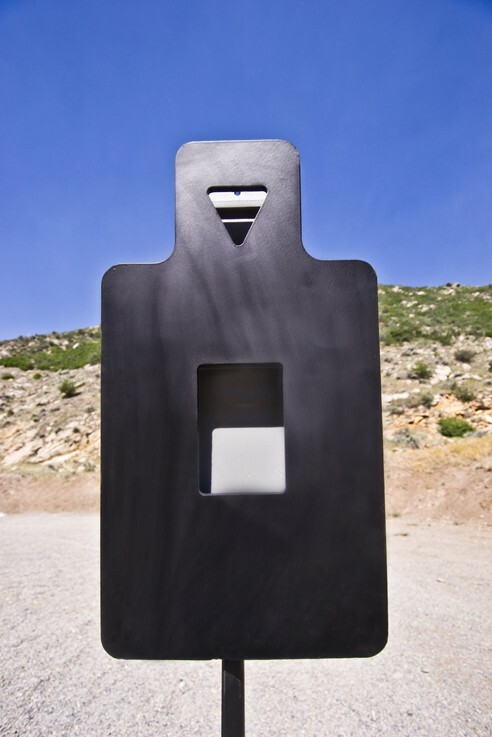 Shooting on the Action Target Dueling Tree (a dueling tree target) puts you in a position where you have to make hard shots under stress while reacting to changes in the environment, which allows you to better prepare for real life situations. As a professional trainer, my research and experience have brought me to the conclusion that shooters use sights three different ways when responding to deadly force situations. I call them Sight Gears, as the shooter switches or changes “gears” in how they use their sights based on reaction to existing threats. 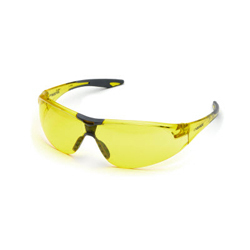 Sight Gear #1 = Perfect Sight Alignment – Is typically used under controlled conditions where the shooter is not subject to stress related factors that are conducive with the physiological response of the body under stress. 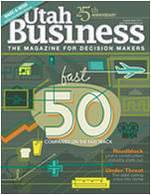 The heart rate is under 140 BPM and the shooter minimizes movement, seeking the “perfect” shot. 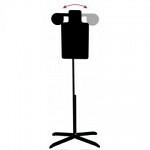 This gear is most commonly used during shots involving distance (usually 25 yards and beyond) or surgical shot placement where the shooter needs to make a partial body shot or head shot on a threat up close. Sight Gear #2 = The Flash Sight Picture – This gear rules the world of gun fighting, especially with handguns! It is considered a complex motor skill where the shooter still has the ability to see/use their sights and is not affected by vasoconstriction. The heart rate is around 140 to 160 BPM and combat breathing is required to control the heart rate and flood the body with oxygenated blood to keep vasoconstriction at a minimum. The sight picture is no longer perfectly still during execution of the shot (usually due to dynamic action) and the front sight “wobbles” in the rear sight box, independently from the overall movement of the sight picture. 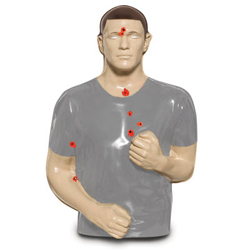 Combat hits come quicker using this method; however, shot placement is managed by selecting an area to hit on the threat vs. a precise point of impact. We call this application Tactical Speed Shooting. 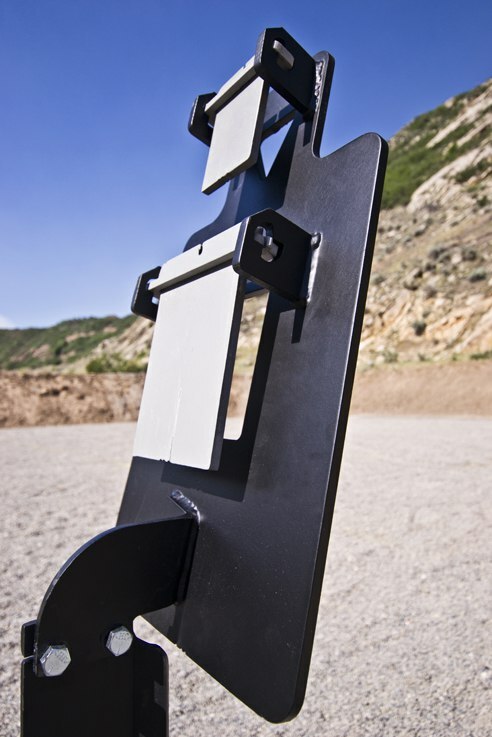 This sight gear is most commonly used with handguns from 15 yards to as close as two yards. Sight Gear #3 = Front Sight Proximity Shooting – This gear is used when the shooters heart rate is roaring at about 165 to 180 BPM. The shooter is limited to gross motor skills and vasoconstriction has temporarily impaired the ability to focus on the front sight. Binocular vision and focus will remain on the threat until combat breathing reduces the heart rate and oxygenated blood is restored back to the eyes. We call this Front Sight Proximity Shooting, as the top of the handgun and front sight area are visible to the shooter in the peripheral, but completely out of focus (when the pistol is at full extension and indexed on target). 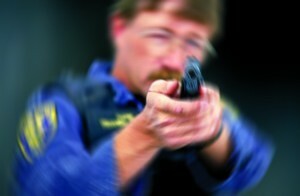 Using this technique, the shooter is conditioned to be aware of the handguns proximity in relation to the threat and is able to get multi-shot, devastating hits on the threat quickly by indexing the pistol to where the shooter is looking. When we run the 6-shot drills in our pistol courses using this sight gear, we are seeing shooters get six hits on target, in about a 4” to 6” group on the threats center mass in an average of 1.00 to 1.25 seconds! Conditioned shooters are applying six rounds in sub .90 seconds! 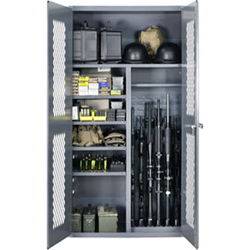 This gear is most commonly used by shooters during spontaneous deadly-force confrontations at three yards and in. 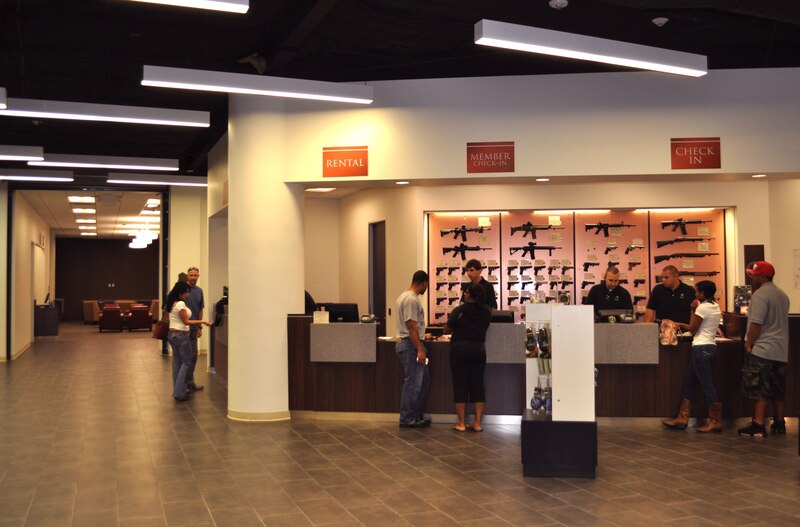 While this is a general summary of what we teach in our training courses, the goal of this article is to encourage instructors to prepare students to learn how to use their sights other than just perfect sight alignment! As always, stay safe and Fight to Win! John is an active duty police officer with the Orland Hills Police Dept. (IL.) and has more than 21 years of experience in LE. He has previously served as a patrol officer, rapid response officer, FTO, and firearms instructor with Chicago PD. 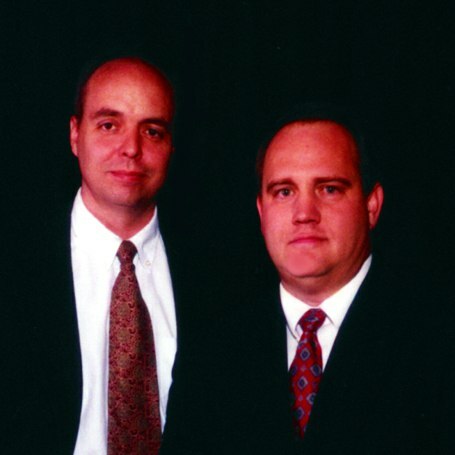 He is a graduate firearms instructor from the Secret Service Academy, FBI, DEA, and FLETC. 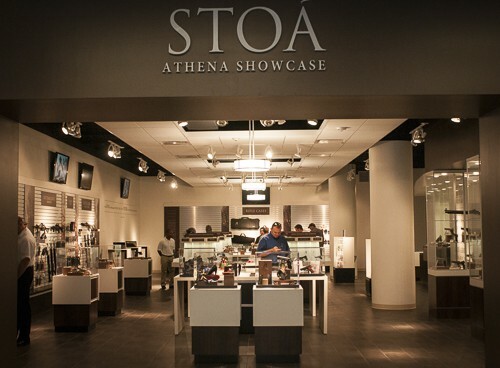 John is founder and president of Spartan Tactical Training Group, Director of Training for the DS Arms LE Training Division and has previously presented at training conferences across the country with the AFTE, ASLET, GTOA, IALEFI, ILEETA, ISOA, LETC, MidTOA, NTOA, and TTPOA.